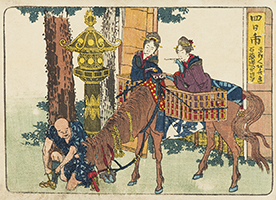 A travel industry developed and flourished during the Edo Period because an infrastructure was created to facilitate large daimyo processions moving to and from their domains and Edo. Japan at the time did not include all of the islands that presently make up the country today. It consisted of the islands of Honshu, Shikoku and Kyushu (plus a number of much smaller islands). Only the southern part of Hokkaido came under the influence of the Japanese government during this period. 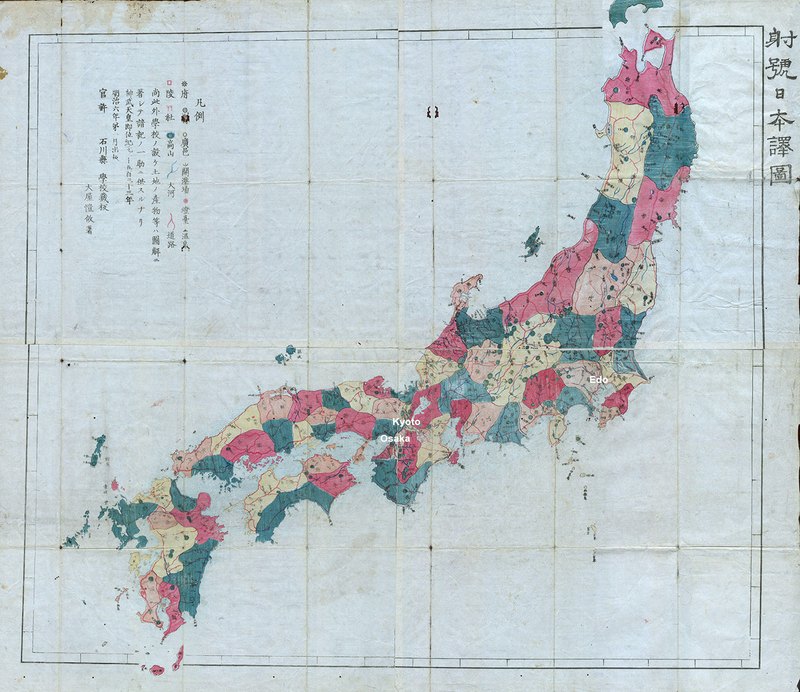 The country was divided up into territories each ruled by a daimyo. All daimyo had sworn allegiance to the Tokugawa shogun, who ruled the country from Edo. In the early years of the Edo Period a system of alternative attendance, sankin kotai, was made mandatory for all daimyo. They were required to spend 50% of their time in Edo along with a number of their samurai retainers. For large domains this meant up to 3000 people moving back and forth. 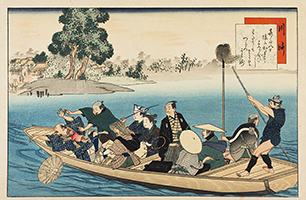 Where possible daimyo preferred to travel by land rather than sea as the weather was so unpredictable that more delays were encountered on sea routes. Also, the cost of the ships and sailors made travel by sea more expensive than by land. Most of the entourage took land routes, though heavy goods were sent by sea. Generally a procession to Edo consisted of an advance party followed some days later by the main group. If it were a large domain there might also be a third group following later. 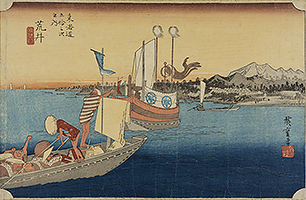 Tokugawa Ieyasu‘s government took control of the major routes to Edo in the early 1600s. 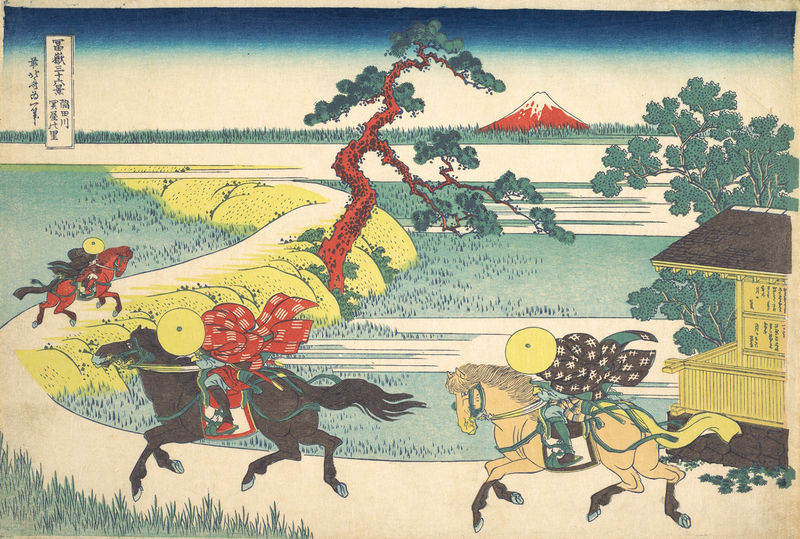 These were called the Gokaido, or Five Highways. 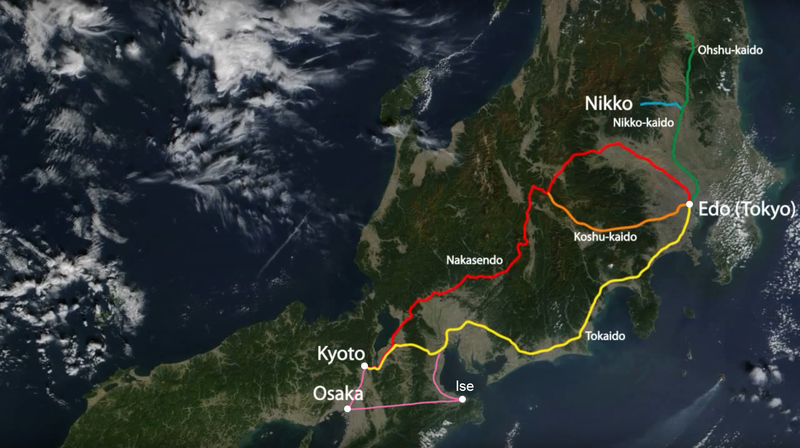 No matter where a daimyo was coming from, he would end his journey to Edo on one of these highways. The government set specific numbers of post stations that were required for each road and they specified the requirements that the post stations had to fulfill. They also created checkpoints along these roads where travellers would have to present their travel documents and where they might be checked for contraband goods. Post towns had to be within a half-day walk of each other. The law required them to provide services for travellers: food, lodging, porters and stables. They were required to give preferential treatment to those on official business such as government envoys and messengers. Express riders carried mail, documents and goods. Everyone else walked or was carried. The law also required the towns and villages along the road to maintain it. For example paths were kept level, stones laid where needed, trees planted along the roadside for shade, etc. The Tokaido is called a road, but much of it was just a foot path, suitable for people and horses, but not vehicles. The most heavily travelled and best maintained was the Tokaido. 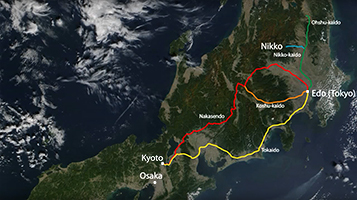 It was the shortest route between the two capitals, Kyoto and Edo. The section between Maisaka and Arai was by boat and there were many rivers to ford, so weather was a frequent source of delays. For this reason some daimyo preferred the Nakasendo which was longer, but did not have large rivers to ford or any sea crossing. There were no bridges over many rivers because they were not permitted. This was a Tokugawa military strategy to make it more difficult for armies to travel cross country, reducing the possibility of a surprise attack on Edo. Travellers had to be ferried across some rivers in small boats and cross others on foot or be carried by porters. Sometimes the rivers could not be crossed due to inclement weather or high water and travellers had to wait, delays that could last a week or more. The Oi River was the widest river on the Tokaido. 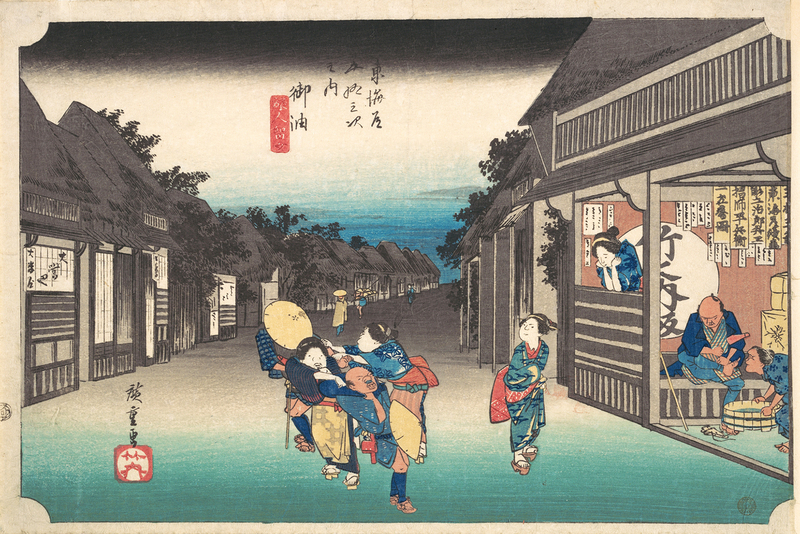 Porters lived in the towns either side of the river (Shimada on the east bank and Kanaya on the west). They carried both people and baggage across the river. Those who could afford to rode atop platforms carried by porters. The less affluent were carried on a porter’s shoulders. 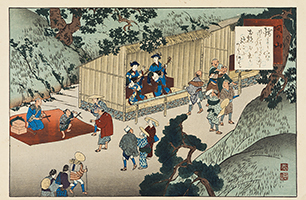 Daimyo and other high ranking persons crossed in their personal palanquins carried atop a wood platform. As they were so important extra men were used and extra precautions were taken when they crossed. 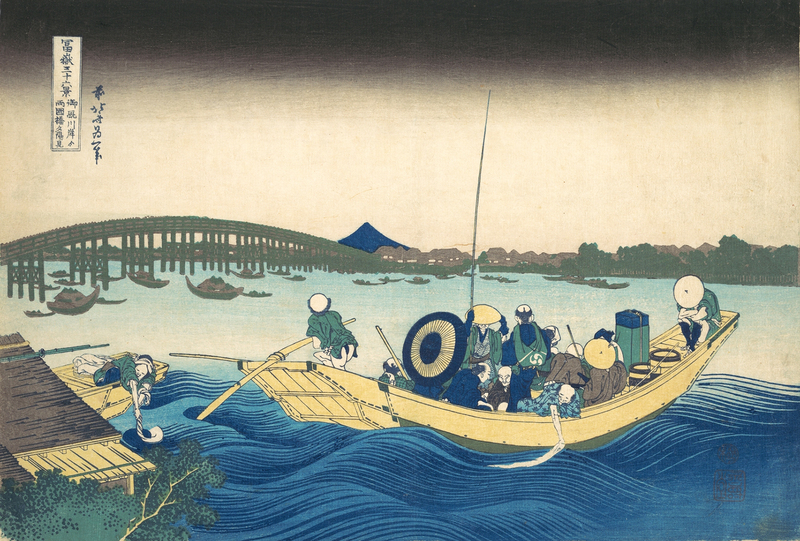 The length of the journey along the Tokaido depended on the weather. At the best of times it was possible to do it in a week, but inclement weather could mean the trip took a month. It could take a daimyo from a more distant region many weeks to travel to Edo from their domain. The first “tourists” were samurai. 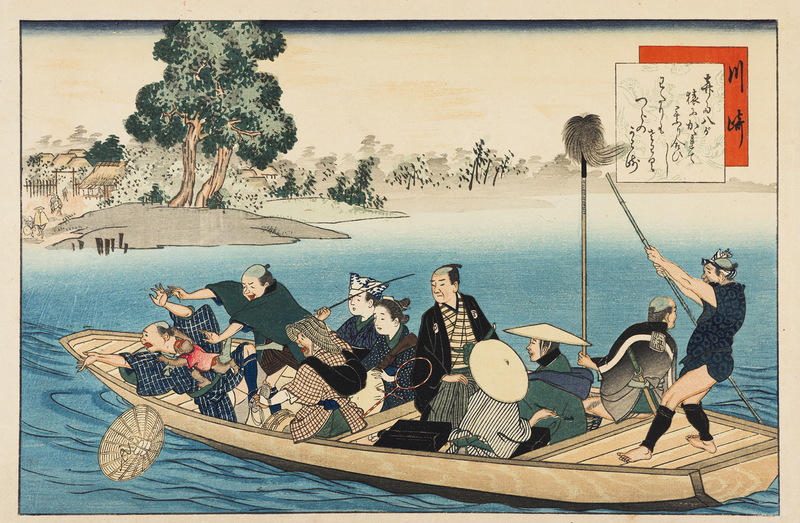 Daimyo made stops along their route to visit famous places, though this was more common on the return journey which was more leisurely than the journey to Edo when they were expected to arrive by a certain date. Retainers accompanying them also sometimes had free time to visit shrines, temples, and other places of interest while on these journeys. Those from the regions who accompanied their lord to Edo also had ample opportunity to sightsee in the big city. Boats transport passengers between the stations of Arai and Maisaka. 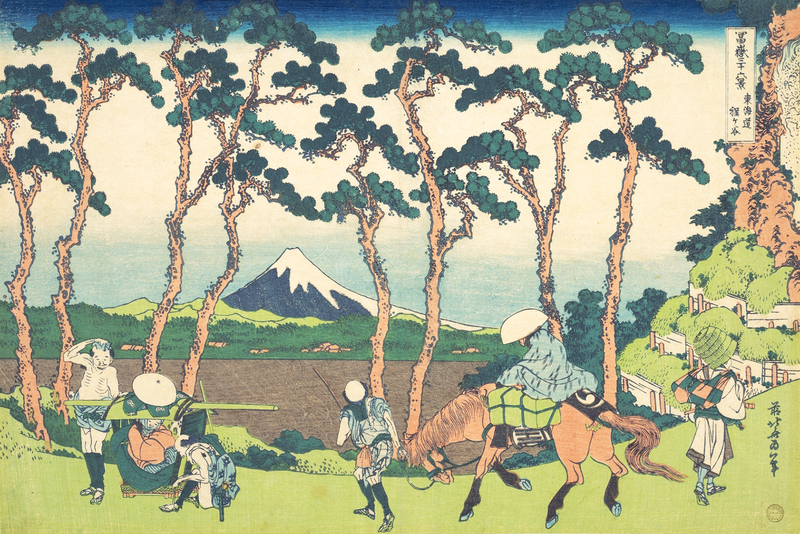 Beneath the samurai were three other social classes: Farmers, Artisans and Merchants. These classes, like the samurai, were thought to have specific roles and responsibilities which they should adhere to if social order was to be maintained. Farmers lived in villages run by a headman and a council. They were expected to work hard. Books were forbidden to them as they would distract from their work in the fields. They were to grow only useful crops. For example the government attempted to regulate tobacco and from 1609 onwards it was occasionally prohibited, but eventually they gave up. The ruler’s goal was for farmers to be taxed as much as possible while still leaving them enough to live on. A law of 1642 decreed that farmers should consume miscellaneous grains and not too much rice. They had to bow and uncover their heads when a samurai passed. In the cities merchants, shopkeepers, craftsmen, peddlers and day labours were collectively called chonin. Chonin lived in wards within the city and each ward elected a headman. They were not generally permitted to attend samurai functions and entertainments and were banned from political activity. Commercial activity should exist only in so far as it was necessary. Merchants were thought to personify greed and acquisitiveness was to be discouraged. If any of the lower groups did acquire wealth they were not to flaunt it. In general the 17th century was a prosperous time. Before the century’s end some of the wealthiest individuals were businessmen. Ventures such as retail, land development, shipping, money-lending and money-changing were very profitable. Farmers too were doing better. 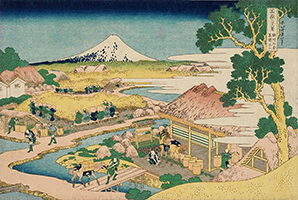 The amount of arable land increased, farming techniques improved, and most importantly, farmers were growing more cash crops and engaging in small-scale manufacturing, like oil-pressing or sake-brewing. Subsistence crops, especially rice, were taxed more heavily than vegetables, cotton, indigo, tobacco, etc. Overall the standard of living increased, even for servants as there was often a shortage of good servants and their wages increased. By the end of the 17th century most people ate three meals a day instead of two and had at least some disposable income. 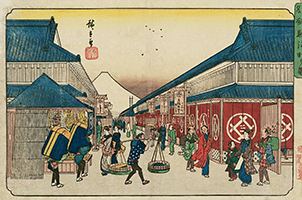 Once there was a system of good roads and post stations in place for the samurai other travellers could make use of them too, for example merchants, traders, peddlers, itinerant performers and others who made their living on the road. As their affluence increased, many farmers, artisans and merchants could afford to go on pilgrimages and become “tourists” too, travelling for pleasure or adventure. People needed to purchase travel permits (from the village headman or the ward headman) for the government operated barriers or checkpoints along the roads where their credentials would be checked, but in general it seems travel became easier through time and tourism became more commonplace. Nobody at the time travelled cross-country in a carriage or a cart. Most people walked, but for those who could afford it there were options. One could be carried in a kago. These were essentially covered hanging baskets with wooden bases and a sort of tarp that could be up, or down for privacy or to keep the occupant dry. Horses for hire could carry 1 or 2 people, but they would be led by an attendant rather than ridden. Only samurai or official messengers could ride horses themselves. Many facilities developed for the ordinary traveller. There were places along the roads where travellers could stop for refreshments, often with a scenic view. Towns along well-travelled routes began to produce local novelties and specialities – distinctive foods and souvenirs visitors could purchase. Guidebooks for travellers were published as early as the 1660s. These included descriptions of towns and the services they provided and recommendations on where to stay, eat, which local shrines and temples were worth a visit, and what local products and delicacies might be enjoyed. There were similar guidebooks for the major cities. There was fierce competition for traveller’s business and waitresses from the local inns would call out to passersby to entice them to stay with them. Inns provided food and a hot bath as well as a bed. Some inns provided additional services, such as masseurs or women who could be engaged for the night. Waitresses in the town of Goyu were particularly known for their aggressive solicitation of customers. 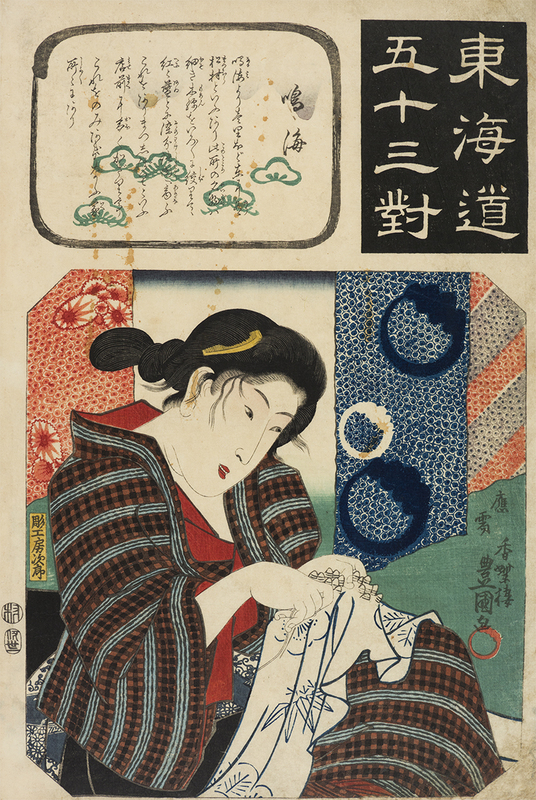 Local products sold as souvenirs were things such as shibori fabric sold in Narumi and distinctive folk paintings sold in Otsu (Otsu-e). People would generally say they were going on a pilgrimage rather than a holiday or vacation, but it amounted to the same thing. Pilgrimages became a real fad during the Edo Period, but many of the towns also had brothels and for some they were a bigger attraction than the religious sites. Everyone went on pilgrimages. Just as city people travelled the highways for excitement, so country people visited the big cities. Pilgrims from rural areas generally travelled in small groups. 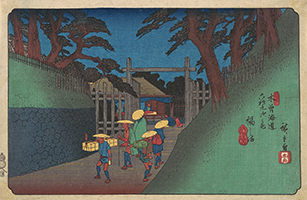 Here a group of rural pilgrims leave Zojoji Temple in Edo, followed by a group of novice monks. Women do not appear frequently as travellers on the major highways. More often they are shown sightseeing closer to home. Here some women visit the beach at Shichirigahama. This was about 48 km. from Edo. The beach was famous for the view. On a clear day one could see both Mount Fuji and Enoshima Island. 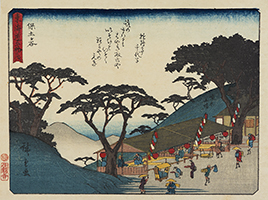 Of the many pilgrimage routes, the most popular was to the Great Shrine at Ise. 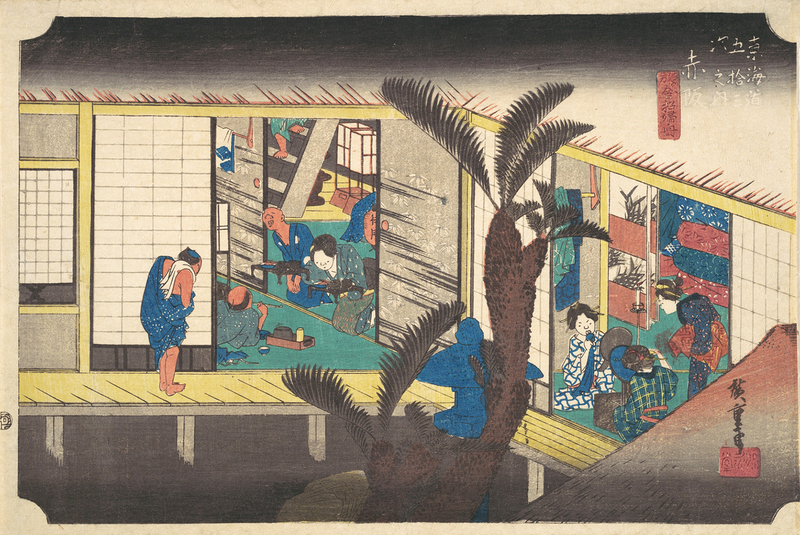 It has been estimated that 10% of the population visited Ise during the Edo Period. 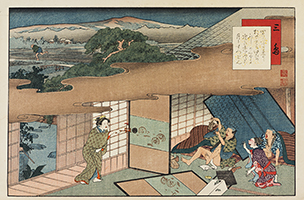 Do you remember the group of artists and a writer who were arrested along with Utamaro in 1804 for producing material that made fun of Hideyoshi, and by association, the shogun? The one author in this group was Jippensha Ikku (1765-1831). 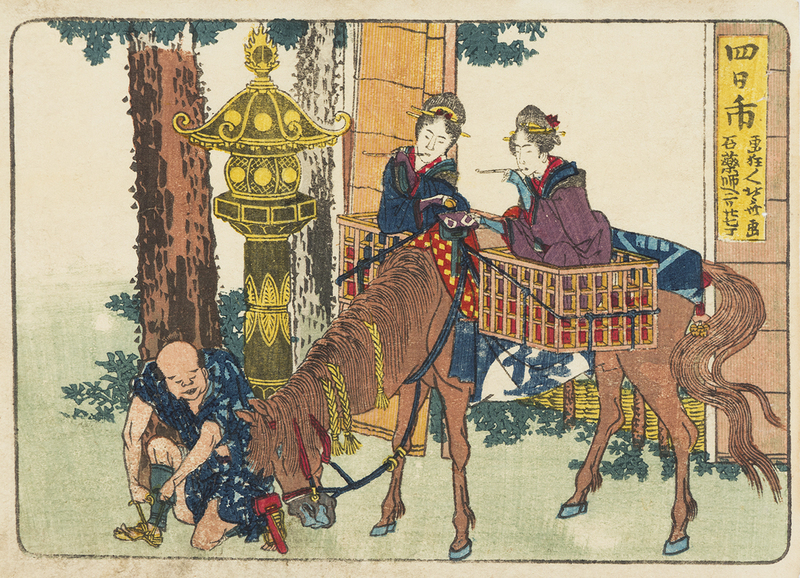 At the time of his punishment for portraying Hideyoshi as a snake (literally) in a comic novel in 1804, he was already well known for the first installments of his comic travel novel, Hizakurige, generally called Shank’s Mare in English. This story came out in a series of installments between 1802 and 1809. It followed two Edo chonin named Yaji and Kita on their pilgrimage to Ise, which took them along the Tokaido Road. In addition to being a comedy, it was also a guidebook as it contained much of the same kind of useful information found in more standard travel guides. As an example, here is a very brief summary of their adventure at Odawara, where they stay at an inn with a type of bath they are not familiar with. The bottom of the tub is a thin sheet of iron, under which is a fire to heat the water. Water in this type of tub could be heated more quickly than in the common tub with a wooden bottom. A piece of wood floats on top of the water and bathers are supposed to submerge the floating wood and stand on it so as not to scald their feet. Yaji is the first to take his bath. He assumes the wood on top is a lid and takes it off. He burns his feet in the bath, so he puts on geta (wooden shoes). It was a terrible faux pas to wear shoes in a bath. Kita comes in and Yaji tells him the bath is wonderful, but hides the geta. Kita bathes next, burns his feet too and then finds the geta. Wearing the geta he breaks the bottom of the tub, burning himself more, and has to pay compensation to the astonished landlord. Another adventure begins on the way to Mishima. They are befriended by a stranger along the road and buy a turtle from some children. While sleeping at the inn in Mishima the turtle escapes and bites Yaji’s finger, hanging on tightly. In the ensuing confusion the stranger steals Yaji’s purse and sneaks off in the night. One last sample story: Ainoyama was a road running between the inner and outer shrine at Ise that was lined with vendor stalls and entertainers. Sugi and Tama were women who played shamisens and sang. They permitted (or encouraged) people to throw coins at them and they were exceptionally skilled at dodging or deflecting them while continuing their act. Edo pilgrims were reputed to throw more than they could keep up with and Yaji and Kita tried, unsuccessfully. In frustration Kita threw a pebble at one woman which she caught in her mouth and spat back, hitting Yaji on the face. Combining travel info with a lively comedy story was a new idea, and the stories became hugely popular, so much so that Jippensha Ikku continued the story with Yaji and Kita travelling to other areas of Japan. He also produced a prequel – the back story of their lives in Edo before they embarked on their travels. Later, when he lost everything in a fire, he returned to writing the adventures of Yaji and Kita. Thanks to popular demand, in one way or another Jippensha Ikku continued to write stories about Yaji and Kita for the rest of his life. As a result he himself travelled a great deal, researching and looking for ideas for his stories, stories that introduced the public to a more lively and vivid view of life on the road and no doubt inspired more people to either embark on journeys themselves, or to dream of travel. 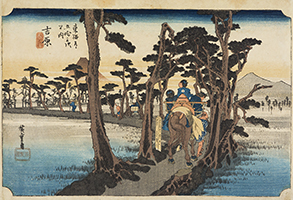 In spite of the popularity of the travel industry there were not many woodblock prints showing landscapes until around 1830. This was largely due to the lack of a stable blue pigment. In the late 1820s a deep blue pigment known as Prussian blue became available for use in prints. This blue pigment was created by a paint maker in Berlin around 1706. It is the first modern synthetic pigment and is produced by oxidation of ferrous ferrocyanide salts. When mixed with hydrogen peroxide or sodium chlorate it becomes Prussian Blue. In 1752 a French chemist discovered how to reduce it to a powder which could be reconstituted with hydrogen cyanide. Prussian blue was used for art in Europe as early as 1709. Also, it was used to dye the uniforms of the Prussian army from the early 1700s through to the early 1900s, hence the name Prussian blue, although in Prussia they called it Berlin blue. It is still in wide use – perhaps in the ink in your pen – and is not only a pigment, but is used medicinally as an antidote for certain kinds of heavy metal poisoning. It reached Japan via China in the later 1700s, but was very expensive. By the late 1820s it became available in sufficient quantity and at a low enough price that it could be used for woodblock prints. 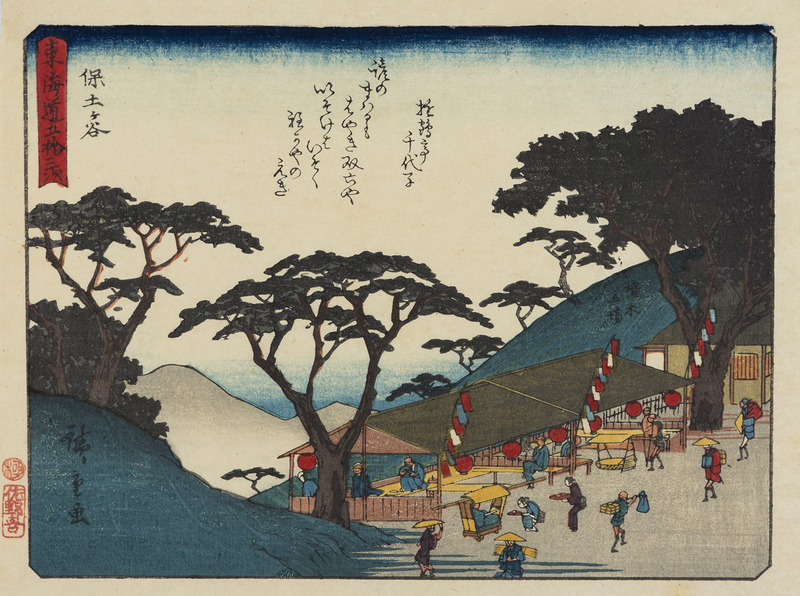 At the beginning of the 1830s two artists made good use of Prussian Blue in the production of large sized landscape prints: Hokusai, in his 36 Views of Fuji series, and Hiroshige in his 53 Stations Along the Tokaido series. Both enjoyed great success. 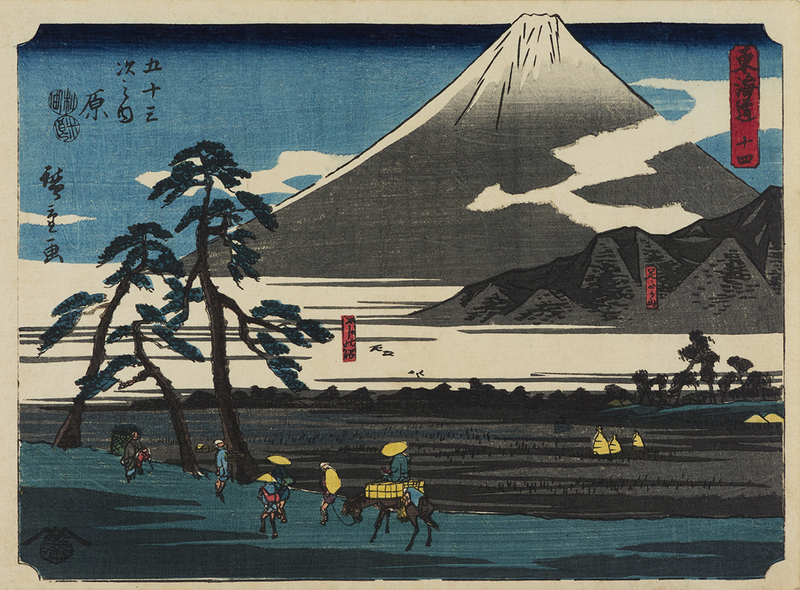 Hiroshige (1797-1858) was the son of a low-ranking samurai serving the shogun. His father’s job was fire warden at Edo Castle. When both his parents died in 1809 he inherited his father’s position and small stipend. 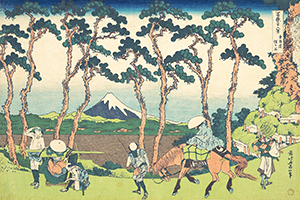 The actual duties did not entail much, so Hiroshige, who had been interested in art from a young age, was able to study with the ukiyo-e artist Toyohiro from the Utagawa school. In 1823 he handed over his fire-warden duties to a relative so that he could concentrate on his art full-time. Hiroshige illustrated books and designed pictures of beauties, kabuki actors, and bird and flower prints. 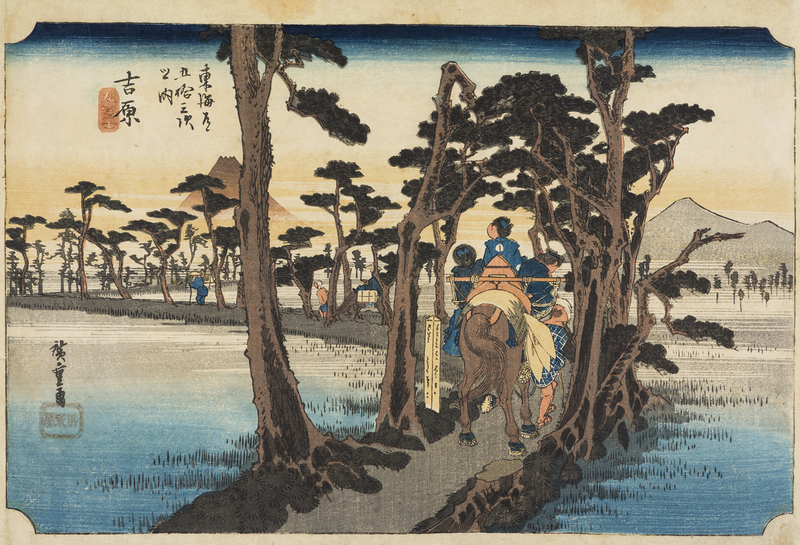 In 1832 Hiroshige was invited to join an official procession to Kyoto. 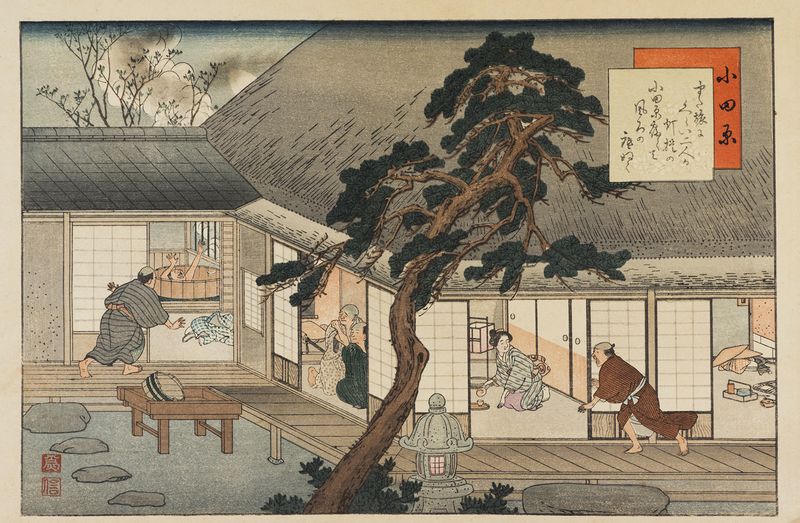 He made many sketches along the way and upon his return he began to produce his first Tokaido series. 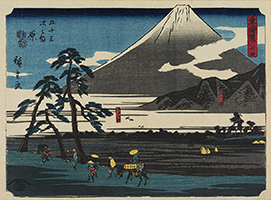 This series was immensely popular and cemented Hiroshige’s reputation as a landscape artist. 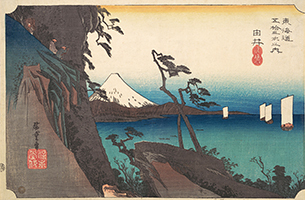 From then on he specialized in landscapes (though not exclusively), producing a variety of series including at least 15 more on the Tokaido road theme.